Please use this thread for all non official events such as Cinema Sightings/nights out & shopping etc. F&L at the cinema. They both look quite haggard, Felipe is growing his beard back. they look like any other ordinary couple going to cinema.... thye don't need to be polished this time! They look just fine, better photo. It's great that they can enjoy simple evening at the movies even if they are the king and queen. They went to see film "Lucy". Felipe's casual outfits always manage to look a bit more polished than Letizia's. i expect she will release a statement of some sort and possibly depending on her schedule go to the funeral. The Kings sent flowers. 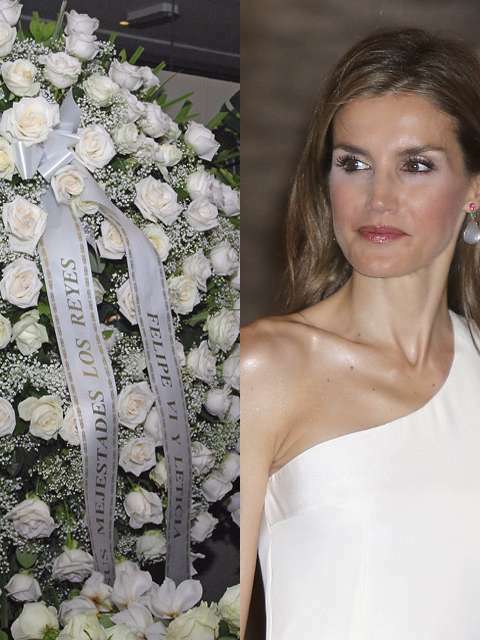 The florist got Letizia's name wrong (? ), it says 'Leticia' instead of 'Letizia'. Gosh, how awkward.... how on earth could this happen? It's the day that every child hates but not even princesses of Spain can avoid the dreaded first day back at school after the summer. Luckily for Leonor, Princess of Asturias and her sister Infanta Sofía, their mother Queen Letizia and father King Felipe came along to hold their hands. Letizia, 41, was every inch the yummy mummy as she swept into the school in a simple grey t-shirt and with her face scrubbed clean of make-up. Letizia looks gorgeous also with no make-up! The girls seemed very relaxed and happy... I'm glad that Leonor is starting losing her teeth as well! September 12 is quite late to be going back to school, over here in England children went back to school on September 1 or round about that time, and I think in other European countries it was similar. I was a little disappointed that we didn't get a "proper" photoshoot of Leonor and Sofia this year, but still it's nice that we got photos. Leonor and Sofia are beautiful little girls and are getting so big now! Before we know it, they will be leaving primary school. Perhaps Felipe and Letizia are following WA and Maxima of the Netherland's example and are trying to give their daughters as much privacy as possible, which therefore means less photos... I hope not, but of course I respect the fact that all royals are entitled to at least some privacy. Here in Portugal, school starts 15 of September, today was just a meeting of parents and teachers. Mine started day 8, this past monday, but I'm on college (university) so it's a bit diferent. I think it´s different on the southern countries where the summer is long and very hot. We were above 32 degrees in Madrid last week. In other parts of Spain they started school last week and there were some protest by teachers and parents. Most schools aren´t well-conditioned and the excesive heat can hurt the children.